In further debunking of the notion that the iPhone X was a "flop" or a "failure" —which was conventional wisdom as recently as the end of April —the flagship Apple device is now the world's best-selling smartphone model, according to a release from the research firm. In addition, the top four models in the world, both in terms of shipment amounts and market share, are iPhones. The report also found that a total of 345 million smartphone units were sold globally in the first quarter. The top Android models were the Xiaomi Redmi 5A and Samsung Galaxy S9 Plus. Apple does not release individual model figures on iPhone sales, but the company said in this week's earnings that it sold 52.2 million iPhones,, and that the iPhone X sold the most units of any iPhone model throughout the quarter. "Customers chose iPhone X more than any other iPhone each week in the March quarter, just as they did following its launch in the December quarter," Apple CEO Tim Cook said on Tuesday's earnings call. "Since we split the line with the launch of iPhone 6 and 6 Plus in 2014, this is the first cycle in which the top of the line iPhone model has also been the most popular." 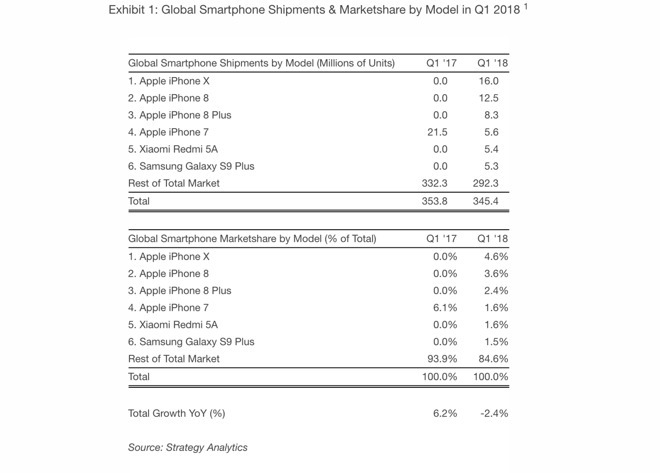 "We estimate the Apple iPhone X shipped 16.0 million units and captured 5 percent marketshare worldwide in Q1 2018. For the second quarter running, the iPhone X remains the world's most popular smartphone model overall, due to a blend of good design, sophisticated camera, extensive apps, and widespread retail presence for the device," Juha Winter, Senior Analyst for Strategy Analytics, said in the company's announcement. "Apple has now shifted almost 50 million iPhone X units worldwide since commercial launch in November 2017. The Apple iPhone 8 and iPhone 8 Plus shipped 12.5 and 8.3 million units, respectively, for second and third place," Winter added. "The previous-generation iPhone 7 shipped a respectable 5.6 million units for fourth place. Combined together, Apple today accounts for four of the world's six most popular smartphone models."